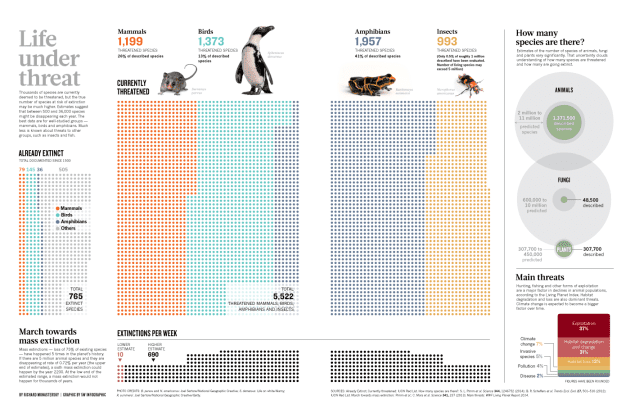 Species on Earth are disappearing at a never-before seen rate in human history. The stark threat hangs over all species – mammals, reptiles, birds, insects – and researchers are still trying to figure out the extent of this potential mass extinction. Now, a new analysis conducted by Nature found that 41% of all amphibians on the planet now face extinction while 26% of mammal species and 13% of birds are similarly threatened. Image via Nature. Download a PDF for the graphic. The most devastating extinction ever took place some 252 million years ago, during the Permian – the last period of the Paleozoic. 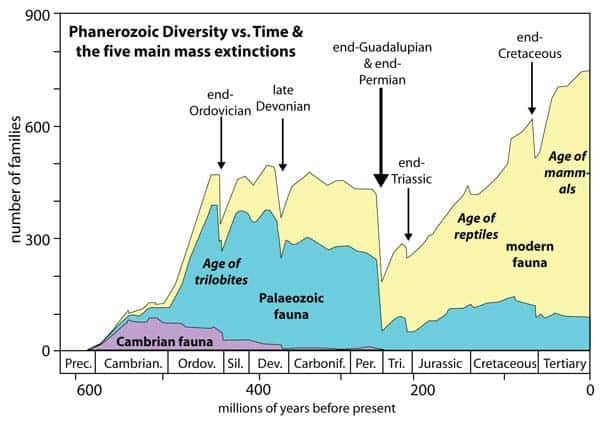 In the Permian extinction, an estimated 96 percent of marine species and 70 percent of life on land became extinct following a yet unconfirmed series of cataclysmic events. In Earth’s history, there have been five major mass extinctions – periods when the extinction rate is much higher than the natural, background rate. The first one to occur was the Ordovician–Silurian extinction about 440 million years ago, and the last one is Cretaceous–Paleogene extinction event, 66 million years ago – the extinction that wiped out the dinosaurs. All the major extinctions are associated with catastrophic events. This time, it’s different. The five major extinctions. Many scientists believe we may be heading towards a sixth, man-drive mass extinction. Image via University of New England. Never in the history of the Earth has a species been so dominant as humans; we are changing the entire planet accoring to our needs, and this is having a huge effect on other species. From the massive deforestation to intensive agriculture which are destroying millions of square miles of animal habitat and to the introduction of invasive species and driving climate change, humanity is pushing the Earth towards a sixth great extinction. 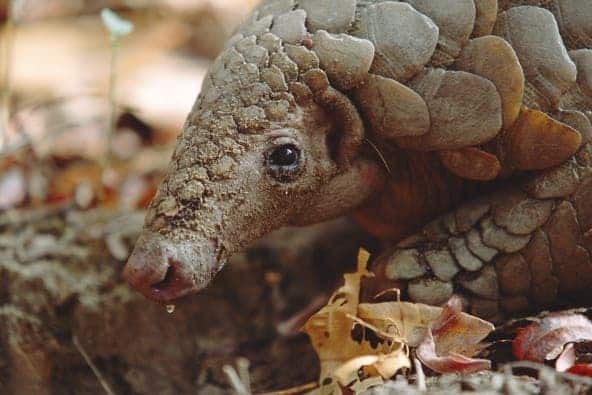 The endangered Indian pangolin, or thick-tailed pangolin (Manis crassicaudata), lives in south Asia, where hunters have targeted the animal for its meat and scales, which are used in traditional medicines. Some 1.7 million species described by scientists, but we still don’t know exactly how many species there are in total. Estimates range from 2 to 50 million. The problem is that researchers have so far sampled only a sliver of Earth’s biodiversity, and most of the Earth’s species reside in a limited habitat – often times the very habitats which are most threatened, like the Amazon rainforest or areas of the ocean. It’s very hard to paint an accurate broad picture. In other words, we know that we’re driving a huge chunk of animal and plant biodiversity extinct… we just don’t know exactly how big that chunk is. However, it’s clear that we need to change our ways if we want to prevent this disaster. Conservation policies could slow down extinctions, but this is not the long term solution we should be looking for. “In general, the state of biodiversity is worsening, in many cases significantly,” says Derek Tittensor, a marine ecologist with the United Nations Environment Programme’s World Conservation Monitoring Centre in Cambridge, UK. This means that what we should be looking for is sustainable change. In other words, we need to change our ways for good, and not just do things to mend our wrongdoings. The two main areas we should focus on are agriculture and overfishing – because this time it’s not a meteorite, it’s not a volcano, it’s not a cataclysm – we’re basically overeating biodiversity, with climate change being the icing on the cake. 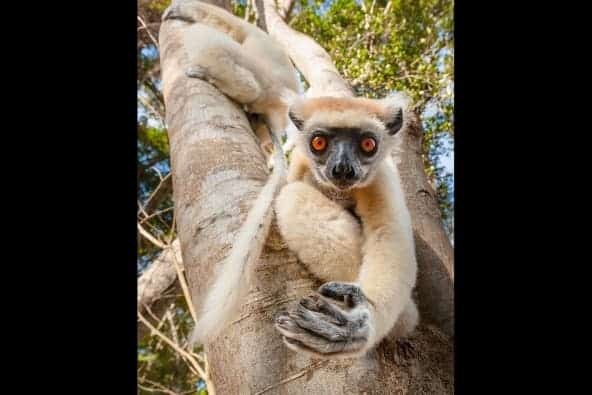 The golden-crowned sifaka, or Tattersall’s sifaka (Propithecus tattersalli), of Madagascar is critically endangered. Habitat destruction and hunting have caused its population to decline since it was first discovered in 1974. “In the case of land extinctions, it is the spread of agriculture that has been main driver,” added Tittensor. “By contrast it has been the over-exploitation of resources – overfishing – that has affected sealife.” On top of these impacts, rising global temperatures threaten to destroy habitats and kill off more creatures. The analysis published in Nature paints a grim picture, but it also highlights what we need to do. First of all, we need to get an accurate picture of what’s happening – for this, governments and international organizations like the International Union for Conservation of Nature have to start a giant census; it may not be the exciting step, but we have to do it – only then can we understand what are the most adequate and effective measures.